The lawyers for former Illinois Gov. Rod Blagojevich in his ongoing corruption retrial are already hated by the judge for wasting time with useless questions. But now they've found a new way to waste time and annoy the judge: By tattling on the prosecutors for "making faces" during the defense's question time. It's really mean! 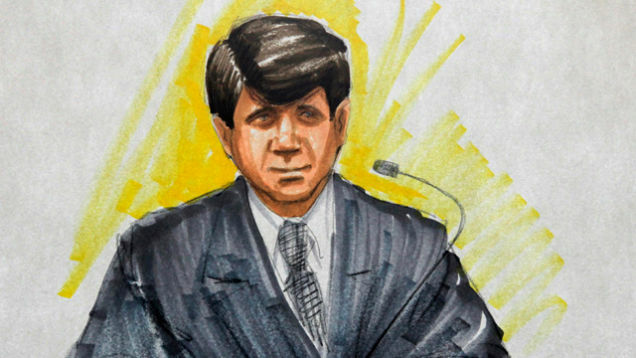 The defense is accusing prosecutors of ''making faces'' while former governor Rod Blagojevich testifies in his corruption trial. Lauren Kaeseberg, a Blagojevich attorney, told Judge James Zagel during the Tuesday morning break that the defense thinks prosecutors are distracting jurors with grimaces and frowns. Judge Zagel said, "I did not see any of this" but said he will watch prosecutors closely. Zagel [said] the only faces he has seen are coming from the first row behind the defense, which is where Blagojevich's wife, Patti, is sitting. Prosecutor Reid Schar told Judge Zagel his team would be "more mindful" of their expressions. Faces should just be banned in the courtroom altogether, to prevent this sort of thing.